The clouds shrouded over the creators of these monuments have been lifted off long back. There is no doubt left that the Pallavas were the authors of these magnificent creations. However, there is still no consensus among scholars on the authorship of individual creations. It is almost settled that it was the Pallava king Mahendravarman I (571-630 CE) who started the tradition of the cave temples in Tamilnadu. His Mandagapattu cave inscription reflects his joy over achieving this spectacular feat; constructing a temple without mortar, brick, metal and timber; an attempt never achieved before his time. This led to a theory whether this Pallava king, Mahendravarman I, played any role in the monuments of Mamallapuram. T N Ramachandran1 and Marilyn Hirsh2 are of opinion that Mahendravarman had a major role in the development of Mamallapuram. While describing the feats of Mahendravarman, Ramachandran suggests that Mahendravarman would have visited Mamallapuram with Bharavi, and provided the latter an opportunity to immortalize his creation, Kiratarjuniyam, on stone, now known as Arjuna’s Penance or Ganga’s Descent. 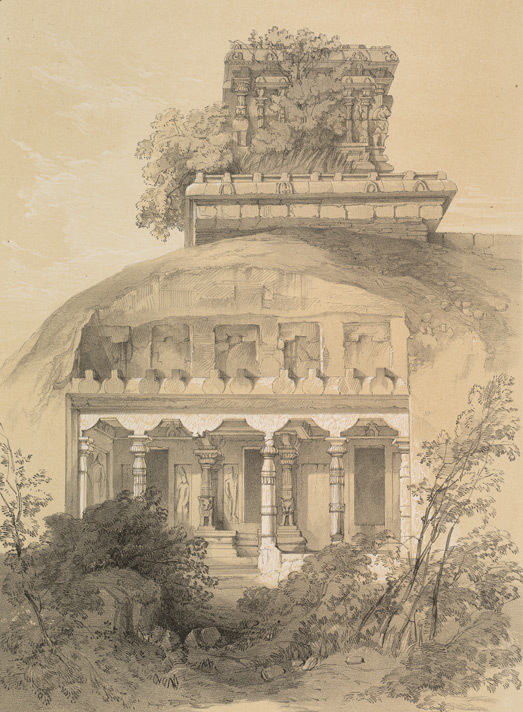 Ramachandran also suggests that the Adi-Varaha cave would have been designed and excavated by Mahendravarman, and the royal portraits inside the cave temple represent him and his father, Simhavishnu. Hirsh is of opinion that matching Mamallapuram with title ‘Mamalla’ and thus attributing the authorship of its monuments to Narasimhavarman I is a very frail theory. She emphasizes on Mahendravarman I being the first patron of the site. About the inscriptions on these monumenyts, enumerating various titles and names of other later Pallava kings, Hirsh suggests that these inscriptions are put on walls and floor suggesting these are later additions. She also explains the reason these monuments were left in an incomplete state, stating that this abrupt cessation of work was due to the withdrawal of the patronage of Mahendravarman and rejection of the eccentric nature of his monolithic program by his immediate successors. It would not be surprising to find Mahendravarman I active in Mamallapuram however we do not have very convincing proofs to prove it. Apart from few cave temples resembling the primitive stage of architecture, similar to the other Mahendravarman works, there is nothing concrete to link this Pallava ruler with the site. Another fact, and a significant one, is absence of his inscriptions. Mahendravarman engraved his inscriptions on almost all of his constructions, and Mamallapuram being an important site, why he did not leave his signature would remain unexplained. The next Pallava ruler to be considered in line is Narasimhavarman I, the son and successor of Mahendravarman I. Narasimhavarman bore the title ‘Mamalla’ and therefore he is also linked with the etymology of this town. 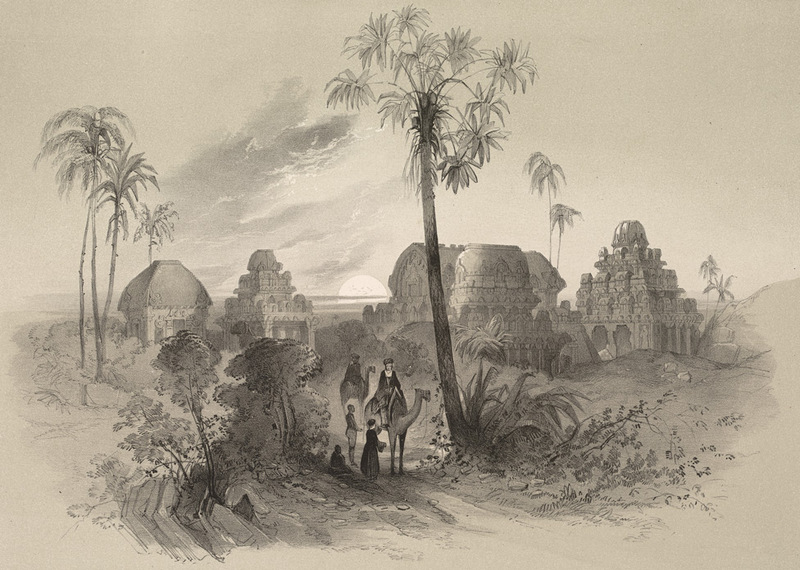 Many scholars are of opinion that Narasimhavarman founded Mamallapuram and named the town after his title, Mamalla. He is also attributed to use the town as a sea port to send his army to Sri Lanka in order to help his friend Manavanna, as mentioned in Mahavamsa. 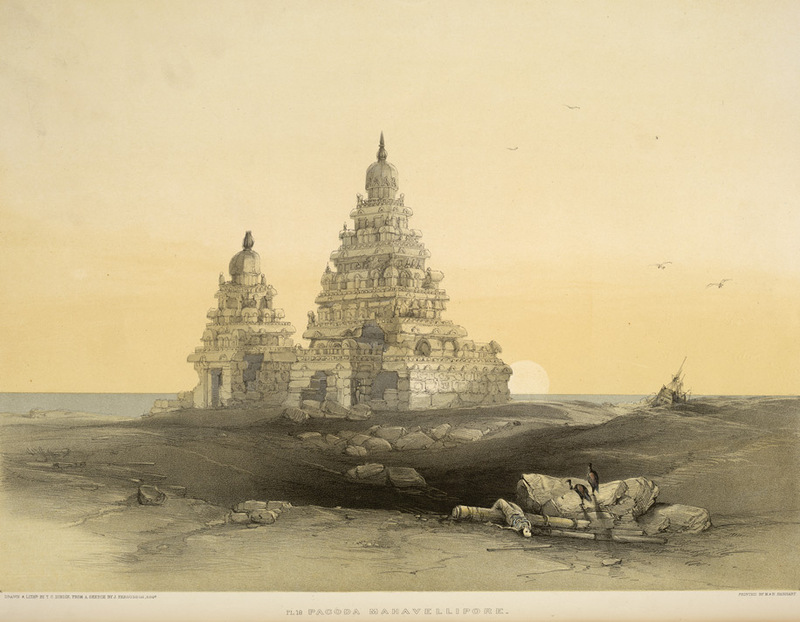 In a later Pallava epigraph, Chitrur plates3 issued by the Pallava king Nrpatungavarman, it is told that Narasimhavarman created a sleeping temple (sayyagrha) with stones in the midst of the ocean for Lord Vishnu. This temple in midst of ocean most probably refers to the Vishnu temple of the Shore Temple complex. Few inscriptions on the monuments of Mamallapuram refer to the titles borne by Narasimhavarman. All these above evidences led scholars to postulate a theory that the town was established by Narasimhavarman and he therefore is the author of many of its monuments. K R Srinivasan4, in his pioneer work on the cave temples of the Pallavas, postulates a theory based upon the styles of pillars. He tells that the pillar style comprising of an octagonal section in between two cubical sections is analogous with Mahendra period. During the time of Narasimhavarman I, the base of the pillars transformed into a seated lion or vyala, and the shaft above it became slender and tapered. The style of the pillars soon underwent another modification cycle, during the time of Narasimhavarman II Rajasimha, when the seated lion base was replaced with a rampant lion. We have cave temples in Mamallapuram where all three kinds of pillars are found, some caves have only one kind and some have mix of styles. Interestingly, we have few specimens which do not confirm to this theory. Atiranachanda cave temple, constructed during the time of Narasimhavarman II Rajasimha, has pillars of the styles of Mahendravarman I. Of course the theory of evolution in pillar styles is ingenious and very interesting, however as this evolution spans over a short period of about hundred years, and during that period amalgamation of different styles might have been a norm. From the above evidences, it is very clear that Narasimhavarman I was active in Mamallapuram. Though he might not be founder of the town, however he brought the town into prominence. Therefore it is very probable that he was involved with the excavation of various monuments. A majority view among scholars treats this Pallava ruler as the author of various cave temples, except few, the rathas and relief panels of Mamallapuram. In few cases, Narasimhavarman I is treated as the initiator of the work, and the work might be been completed by his successors. The next Pallava king in line is Mahendravarman II, the son and successor of Narasimhavarman I. As Mahendravarman II only ruled for about two-three years, we can skip him in authorship consideration. His son and successor, Parameshvaravarman I, had a good long rule and therefore considered in our study. While discussing Adi-Varaha Cave Temple, we have proved that it was Parameshvaravarman I who inscribed the imprecatory verses on various cave temples and Ganesha Ratha. Therefore it can be safely assumed that consecration of these cave temples and Ganesha Ratha happened during his reign. The cave temples which have mark of Parameshvaravarman, the imprecatory verse, are Adi-Varaha cave, Dharmaraja Mandapa and Ramanuja Mandapa. We may not be sure if work on these caves was started during his reign, however it seems clear that these were consecrated by him and therefore we find his imprecatory verse on these. The same applies to Ganesha Ratha, as it also appeared to be consecrated during his time. Scholars have not given much importance to Parameshvaravarman while considering the authorship of these monuments. One reason of this is that though Parameshvaravarman I ruled for about twenty-five years, however his rule was not that peaceful as he was in constant threats from the Chalukyas of Badami. For a short period, he had to leave his capital city when the Chalukyas penetrated into the Pallava dominion. Though he got back the Pallava supremacy and this struggle would have kept him busy, keeping him away from arts and cultural activities. He probably continued the support for the ongoing construction activities at Mamallapuram but did not start something afresh. The next and the last Pallava ruler, considered in our study of authorship is Narasimhavarman II Rajasimha, son and successor of Parameshvaravarman I. This dynamic and strong Pallava monarch was a multi-faceted personality. His title ‘Atyantakama’ indeed reflects his true character. He constructed various structural temples including those as Kanchi and Panamalai. As per a later Pallava inscription5, it is told that Rajasimha spent all his wealth in the temple construction. It is evident that he started the tradition of the structural temples and the Shore Temple at Mamallapuram is also his creation. He is also the author of the Atiranachanda Cave Temple. His title ‘Atyantakama’ is inscribed on many cave temples in Mamallapuram. The imprecatory inscription discussed above with Parameshvaravarman also contain this particular title among various other titles which are ascribed to Rajasimha. Based upon this evidence, R Nagaswamy6 suggests that all the monuments in Mamallapuram were the creation of Rajasimha. It is very interesting indeed, if we take into account the inscriptions found at various monuments in Mamallapuram, we will come to know that all these inscriptions contain one or many titles born by Rajasimha. Therefore, it simple suggests that Rajasimha was the author of all these various monuments. But there are few points which contradict this theory. The first point against the theory is the imprecatory verse. This verse is found in the inscriptions of Ganesha Ratha, Dharmaraja Mandapa and few others. These inscriptions contain various titles, including Atyantakama, born by Rajasimha. The definitive Rajasimha inscription found at Atiranachanda cave temple, inscribed in two different scripts, does not contain this imprecatory verse. Why this discrepancy? If Rajasimha was a stauch Shaiva and wanted to spread the Shiva worship, what stopped him not to include this verse in a cave temple dedicated to Shiva? Does this suggest that Rajasimha was not the author of this imprecatory verse? Scholars are divided on this issue, where Fergusson7, Nagaswamy and Dehejia8 are of opinion that this imprecatory verse was a device of Rajasimha, Mahalingam9, Srinivasan, Sivaramamurti10 suggest that it was devised by Paramehsvaravarman I. Another point against this theory of single ruler authorship of Rajasimha is whether it was possible for a single ruler to accomplish this variety and volume of monuments in the reign of about twenty-eight years? Additionally, Rajasimha also built temples at Kanchipuram and Panamalai. Nagaswamy11 thinks that there is no need to doubt on this aspect as we know that Rajaraja Chola & Krishnadevaraya erected far many temples during their reign. Also the technique of excavating a cave temple differs from a structural temple, in former’s case the work can start on multiple sites and no labor required to quarry, transport and polish stones. Therefore, it is very much possible to work on a multitude of cave temples and finish those in small time frame. However, various other scholars are skeptical on this point. Third point against the theory is what exactly Rajasimha had in mind while he experimented in such a variety of architectural styles, starting from very primitive style of Mahendravarman to the rampant lion pillars, his final trademark. This experimentation goes against the idea of gradual evolution in architectural styles. 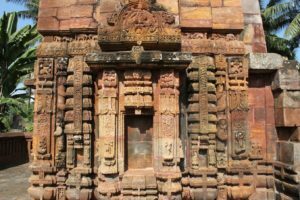 Apparently, he also experimented in various modes, excavating cave temples, carving out monoliths, sculpting large bas-relief panels and finally the structural temples. This wide variety in styles and modes used by a single ruler does raise a doubt as to what he wanted to achieve. Did he have some big plan fitting all this variety? Were his artist guilds working on their whims and fancies while trying out new ideas? If he had some concrete plan to accommodate all these monuments in a single thread, this plan is not evident to us at least. Nagaswamy12 responds stating that Rajasimha was following the Agamic and Vedic practices and these temples at Mamallapuram were carved out to suit the Agamic needs. He tells that in the view of the ruler’s attachment to Vedas, a particular hymn might have influenced him the most. The hymn is the number eleven of the fourth prapathaba of the fifth kanda of the Taitriya Yajurveda Samhita, which mentions pasukama, svargakama, annakama and gramakama. The same hymns tells that those who want to attain it should perform sacrifices at altars prepared in different forms. These forms may be square, triangle, a chariot, a wheel and an eagle. This probably initiated Rajasimha to construct edifices with different plans, elevations and designs. Narasimhavarman I Mamalla had considerable association with Mamallapuram as evident from later Pallava records. Parameshvaravarman I is associated with Adi-Varaha cave temple, attested by a later Chola inscription. The imprecatory verse is a device of Parameshvaravarman I.
Narasimhavarman II Rajasimha constructed many monuments in Mamallapuram, including the Shore Temple and Atiranachanda Cave temple. From above, we can safely say that the construction works in Mamallapuram started during the reign of Narasimhavarman I, if not earlier. The work continued till the reign of Narasimhavarman II Rajasimha where new designs were made and on-going projects were continued. Soon after the reign of Rajasimha, all the projects were abandoned suddenly leaving almost all monuments in an incomplete state. A still unexplained feature remains, and that is the title ‘Atyantakama’. This title is engraved on various cave temples and rathas of Mamallapuram. Rajasimha bore this title is evident from his Kanchi inscription. There is no definitive inscription suggesting that this title was also born by Narasimhavarman I or Parameshvaravarman I. Though few scholars suggested that Parameshvaravarman I also bore this title, none of his other inscription substantiate this. In this case, how to explain this title on the works which are supposedly done in the reign of Narasimhavarman I and Parameshvaravarman I? Balasubrahmanyam13 suggests that these titles are the later additions and were carried out by Rajasimha. But why would Rajasimha do this and make funof himself among his mass? It is hard to believe that a king would take credit of some work of his ancestors provided there is no ill feeling among him and his ancestors. Therefore, the theory proposed by Balasubrahmanyam does not hold much weight. Do we have an answer to explain presence of this and other titles on various edifices of Mamallapuram? probably not, provided we agree that Parameshvaravarman I did not bear the title of Atyantakama and Rajasimha did not engrave his titles on existing monuments. For about a period of hundred years Mamallapuram resonated with continuous noise of chisel and hammer. This raises another question, why all the monuments in Mamallapuram are in incomplete state, was the period of hundred years not sufficient to provide final touches to few if not all monuments? This gives us our next riddle, why the monuments of Mamallapuram are left incomplete and this we will discuss in the next chapter. 1 Ramachandran, T N (1933). The Royal Artist, Mahendravarman I. The Journal of Oriental Research Madras vol. 7. The Madras Law Journal Press. Chennai. 4 Srinivasan, K R. Cave Temples of the Pallavas. 10 Sivaramamurti, C (1952). Mahabalipuram. 11 R, Nagaswamy (1986). Mamallai (in Tamil). 12 R, Nagaswamy (1980). The Shore Temple at Mamallapuram in Art and Culture of Tamilnadu. 13 Balasubrahmanyam, S R (1962). The Dharmaraja Ratha at Mamallapuram in Lalit Kala.